Sachin Tendulkar’s resolute batting helped Ranji Trophy champions Mumbai reach a decent 272 for nine against Rest of India on the opening day of the Irani Cup cricket match at the M.A. Chidambaram stadium here today. Pakistan defeated Bangladesh by 5 wickets in the fourth one-day international here today. Set to score 223 runs for victory, Pakistan managed to score 226 for 5 in 49.5 overs. The International Cricket Council is meeting in Mumbai to plan for the major ICC events next year, including the mini World Cup. The meeting is being chaired by ICC’s chief executive Malcolm Speed and will be attended by chief executives of all 10 Test playing countries. 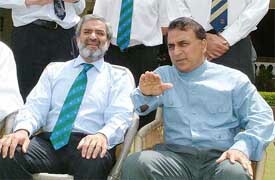 ICC chairman Ehsan Mani discusses a point with former cricketer Sunil Gavaskar at the Brabourne stadium during the two-day ICC meeting in Mumbai on Thursday. Displaying sporting bonhomie, India has agreed to take part in the SAF Games to be held here from March 29 to April 6 next year and formally invited Pakistan to participate in the Afro-Asian Games in Hyderabad later next month. The much-hyped Afro-Asian Games suffered yet another setback today when the All-India Tennis Association announced that tennis would not be part of the Hyderabad mega event due to non-availability of top players from either continents. French Open finalist Martin Verkerk will start for the Netherlands against unfancied Indian Rohan Bopanna in their Davis Cup World Group relegation battle here tomorrow. The Dutch Davis Cup squad, which takes on India here at the weekend, were in mourning after the death of one of the country’s top tennis bosses. Cees van Veen, who used to be the manager of squad member Raemon Sluiter, died on Tuesday of a heart attack at the age of 65. India international Sikha Tandon today qualified for the next Olympics in 50 meters freestyle as she clocked the qualifying mark set for the Olympic entrance for India. She also made her all time best performance in the event clocking 26.61 seconds to set a new national record on her way to win the gold on the second day of the 57th Senior National Acquatic Championship at the Subhash Sarovar swimming pool here. The Sports Authority of India will hold selection trials for the training centre at Mastuana Sahib, Sangrur, for athletics basketball boxing and volleyball from September 24 to 26 according to Karam Singh, Assistant Director, SAI. He said the players in the age group of 14 to 20 years and having any of the first three positions in national and state-level competitions were eligible for the trials. Jiby Malaikkal, a native of Kerala, has come all the way from Mumbai to vie for top honours in the Power Motorsport India National Challenge Rally which will be flagged off on September 20. Jiby who has been sponsored by Gulf Oil Corporation finished fourth in the third leg of the rally held in Kochi. The forthcoming rally will have the participation of nearly 20 top ranked rallyists from entire India. All is set for round four of the Power M1 Challenge Rally here from tomorrow. The ceremonial flag- off will be held at Central Plaza, Sector 17 at 6 pm. A super special stage will be held at Parade Ground, Sector 17, for spectators. The rally will start on Saturday morning and will finish at 3 pm on Sunday as the cars return to the finish line at Leisure Valley, Sector 10. PPS, Nabha, registered their second consecutive victory over Raj Kumar College, Rajkot, 3-0 on the second day of the 17th IPSC Hockey Championship being organised at the Punjab Public School here. 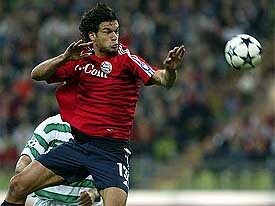 match 2-1. Inter Milan goal-keeper Francesco Toldo (L) celebrates with Fabio Cannavaro after saving Arsenal Theirry Henry's (R) penalty during their Champions League match in London on Wednesday. Inter won the match 3-0. Madhya Pradesh Cricket Association (MPCA) beat Punjab Cricket Club by 22 runs on the opening day of the 10th All-India JP Atray Cricket Tournament at the PCA Stadium, SAS Nagar, today. Ajeetesh Sandhu surged ahead after the second day’s play returning the best card of the day in the Chandigarh Junior/Subjunior Golf Championship at the Chandigarh Golf Club course here today. He played a round of 74. Anirbhan Lihari and Gaganjeet Bhullar, both with identical scores of 77, followed the leader. However Anirbhan with a better first day’s score was placed second. Jaskirat Dullat played a round of 78. Baba Lodhiana Academy, run by the Punjab Basketball Association under its plan to train young budding cagers of the region at Ludhiana, recorded two wins to secure a berth in the semifinals of the First Parminder Yadgari State-Level Basketball Tournament being held at Malout, Muktsar. Indian hockey team leaves for Asia Cup in Malaysia. Tendulkar scored a resilient 94 while Wasim Jaffer (43) and Sairaj Bahutule (58) added valuable runs as Mumbai recovered from a disastrous start. Zaheer Khan was the wrecker-in-chief for the Rest with figures of five for 74, while Anil Kumble chipped in with two for 46. At close, Robin Morris (9) and Avishkar Salve (0) were at the crease. Tendulkar was a cut above the rest. Though rival captain Saurav Ganguly tried everything, it was of no avail as the Mumbai captain showed tremendous concentration power in his first match for Mumbai since the Ranji Trophy final in 2001. 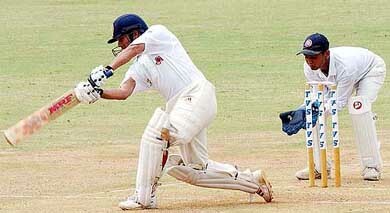 Tendulkar added 149 runs for the sixth wicket with Bahutule in 56.1 overs in 230 minutes. He fell eventually to Zaheer Khan, caught behind by Dravid as he slashed at a rising delivery. The maestro was particularly severe on the spinners, Harbhajan Singh suffering the most. Aware of the batting limitations after Bahutule, Tendulkar went after the Rest bowling as he tried to make the most of his stay at the crease. 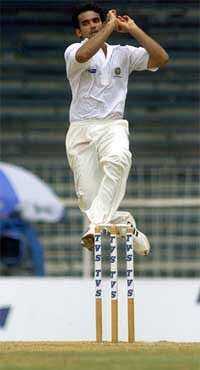 Bahutule, having played the perfect foil, fell tamely with a simple catch to Ganguly at close-in off Kumble. Earlier, asked to bat first, Mumbai openers Vinayak Mane and Wasim Jaffer got off to a good start, but Zaheer Khan wrecked the Mumbai innings with his dramatic second spell, when he bagged three wickets in five overs for 12 runs, changed the course of the match. From 91 for two, Mumbai slid to 95 for eight. Mane (26), during his brief stay, was solid in handling both Zaheer Khan and L. Balaji, as he picked two boundaries off each. Ganguly then turned to Sanjay Bangar and brought on himself at the other end. This paid dividends as Mane tried to cut Bangar and was caught by Kumble. Nishit Shetty started shakily and survived a leg before appeal to Bangar. He had a reprieve when Ganguly floored a return catch in the 18th over. He did not last long and was caught at covers by Sehwag for five off Zaheer. Mumbai (first innings) Vinayak Mane c A Kumble b S Bangar 26, Wasim Jaffer B.L. Balaji 43, Nishit Shetty c V. Sehwag b Zaheer Khan 5, Sachin Tendulkar c R. Dravid b Zaheer Khan 94, Vinod Kambli lbw Zaheer Khan 2, Ajit Agarkar c Parthiv Patel b Zaheer Khan 0, Sairaj Bahutule c V.V.S. Laxman b A. Kumble 58, Robin Morris batting 9, Romesh Powar b Anil Kumble 0, Vinayak Samant lbw Zaheer Khan 4, Avishkar Salvi batting 0. Bangladeshi batsman Rajin Saleh sweeps Pakistani spinner Shoaib Malik in Rawalpindi on Thursday. Earlier, Bangladesh recovered from a slow start to post a respectable total of 222 for eight. The touring side had slumped to 145 for five before a 49-run sixth-wicket partnership between Tushar Imran and Mushfiqur Rahman helped them add 77 runs from the last 10 overs. Rajin Saleh top-scored with 47 from 92 balls. Fall of wickets: 1-9, 2-47, 3-117, 4-126, 5-144, 6-193, 7-212, 8-216. Bowling: Mohammad Sami 10-0-41-2 , Umar Gul 9-1-29-2 , Shoaib Malik 10-0-32-0, Abdul Razzak 9-0-43-2, Junaid Zia 6-0-46-0, Mohammad Hafeez 6-0-22-1. Among those attending include Pakistan’s Ehsan Mani who took over as President of the ICC. He is expected to push for the resumption of India-Pakistan cricket matches. Meanwhile, the ICC has signed a partnership with the Joint United Nations Programme on HIV/AIDS (UNSAID) in Mumbai. To begin with an HIV-positive person will toss the coin before the start of the first cricket Test between India and New Zealand at Ahmedabad next month, cricket officials said here. Indian Olympic Association Secretary-General Randhir Singh said today the visiting Indian delegation has given its consent to take part in the multi-event regional championships while inviting the neighbour for the inaugural Afro-Asian Games. “We have agreed for the dates and India will send a full fledged team to take part in the SAF games,” Randhir Singh told PTI over phone from Lahore. The delegation, headed by IOA president Suresh Kalmadi, arrived in Pakistan yesterday through the Wagah border point to attend the executive committee meeting of the South Asian Sports Federation (SASF) in Lahore. After a brief stay in Lahore, Kalmadi left for Manila last night to take part in the Asian Athletic Conference. “Kalmadi came here to show his solidarity with the SASF before leaving for Manila,” Randhir Singh said. Randhir Singh would head the delegation in the absence of Kalmadi. Before leaving for Manila, Kalmadi told reporters at Lahore that sporting ties between India and Pakistan should always be “kept alive. We are delighted to be here and if we visit each other frequently we can foster not only sporting ties but friendly relations also. This window should always remain open,” he said last night. Kalmadi said it was a good sign that the SAF Games were being revived again, since they were not held according to the original schedule. “The main players have expressed their inability to take part in the event due to prior commitments,” Anil Khanna, secretary general of the AITA as well as the Asian Tennis Federation, said here today. “Besides the Indian players being not available, none of the countries from Asia and Africa were in a position to send their best team. “We thought the sanctity of the games should not be diluted by the participation of second string teams, and hence the decision to drop tennis,” Khanna, who recently got elected to the executive board of the International Tennis Federation, said. Khanna said the AITA had written to the Indian Olympic Association conveying the developments. The Afro-Asian Games are scheduled to be held in Hyderabad from October 24 to November 1. The inaugural edition has been postponed at least twice in the last two years. It was originally slated for November 2002 in New Delhi but was postponed due to a busy season which featured the Commonwealth Games at Manchester in August and the Busan Asian Games in September-October. Verkerk caused a sensation in June when he made the Roland Garros final, defeating former winner Carlos Moya on the way, but he was comprehensively beaten in the championship match by Juan Carlos Fererro of Spain. Today’s draw also paired the experienced Sjeng Schalken, ranked 13 in the world, against 19-year-old Prakash Amritraj, the son of India’s former tennis ace Vijay Amritraj, in the second singles. Saturday’s doubles features Verkerk and John Van Lottum against Bopanna and Mahesh Bhupathi. The Dutch are firm favourites to hold on to their world group slot although captain Tjerk Bogstra has warned his players against complacency. Van Geen also worked for a long time with former Wimbledon champion Richard Krajicek who has since retired through injury. Despite the tragedy, Sluiter said he still intended to play in the three-day Davis Cup World Group play-off tie, which starts tomorrow, if called upon by captain Tjerk Bogstra. “But if Cees was to be buried at the weekend, then my place would be with him. He meant everything to me,” said Sluiter who would probably play in the doubles on Saturday with the singles places going to Sjeng Schalken and French Open runner-up Martin Verkerk. Announcing this Swimming Federation of India secretary-general Virendra Nanavati said Tandon was the only swimmer in the country to qualify so far for the Athens Olympics. The Kartnataka girl, who participated in the Barcelona meet this July, had failed to excel her performance in the 100 meters freestyle. She, however, eclipsed the six-year-old national mark in 50 meters this time of state-mate Nisha Millet during the heats earlier today and reduced her timing by 0.96 seconds in the final this afternoon to defeat Nisha’s sister Reshma. The second day of the championship saw four new national records. While India international Richa Mishra of police rewrote her three-year-old national mark in 400 mt individual medley clocking 5:8.57s to improve her previous record of 5:15.28s set in 2000, she defeated Karnataka’s Ambica MS Iyengar the other promosing swimmer who clocked 5:20.79s. Bhavana Sharma of police finished 3rd (5:28.07). Earlier a strong Karnataka women’s relay team comprising Ambica, Reshma Millet, Shivaranjani and Nisha millet set a new national mark in 4X200 mts medley relay while a police team comprising Murlidharan brothers —Arjun and Amar, Deepak Kumar and Kailash Nath rewrote the national record in the same event. Rising swimmer Srinand Srinivas of Karnataka lifted the 400 mts individual medley gold with a timing of 4:51.50. Arjun Muralidharan of police and Nilendu Jena of services earned silver and bronze. In the other men’s event, Deepak Kumar Singh won the 50 mts breast stroke gold with a timing of 30.43s while South 24 Paraganas lad Gairik Bardhan, representing Bengal, won the silver. Puneet Rana of Punjab earned the bronze. T.A. Sujit of Services won the 50 mt freestyle for men clocking 24.33s, Barun Divkikar of Maharashtra came second (24.56s), while Saiju Joseph of Service came third with 34.61s. The selected players will be provided free boarding and lodging, sports kit, medical assistance insurance cover, outside competition expenses and training by expert coaches. The players are advised to report at the venue on September 24 at 8 a.m. with their sports certificates, two passport also photographs and the date of birth certificate. Jiby told this correspondent that Chandigarh would be a second experience for him since earlier he had come to take part in the Raid de Himalaya rally three years back. He said the hilly route towards Kasauli and further uphill would be very exciting, and challenging. Jiby will drive Honda City V-tek in 1600 cc category and has got the backing of Gulf Oil who are sponsoring him only in this rally. In this rally, about 450 km will be covered which will have 125 km of tougher section. In this rally, there will be three categories , above 800cc, 800 to 1400 cc and from 1400 to 1600 cc. In the past also, Jiby had won the best sportsperson award in the Himalayan car rally held in 2000. He also won the 2001 MAI rally and later in 2002 got the distinction of winning the 2002 rally organised by MAI. Jiby is of the view that success depends on luck, car, driver and weather. On his chances in the rally, Jiby said, he would justify the faith reposed in him by his sponsors. On the speed front, Jiby said, in the competitive section, it might be between 60 to 80 kmh. He was happy that MAI has chosen Chandigarh region for this rally which would now be held every year. The prize distribution function will be held at the Lake Club at 8 pm. Many top drivers are participating in the rally, including ace rallyist Naren Kumar. He is currently leading the rally with 46 points after three legs. Chandigarh’s Karandip Sandhu is second, way behind with 26 points. Naren has won the National Rally Championship three times - in 1999, 2000 and 2002. He also participated in the Asia-Pacific Rally Championship in 2001. At half time both the teams were 0-0. PPS players wasted many chances due to lack of coordination. In the second half, the hosts played most of the time in the opponents’ side. They opened their account in the 35th minute through Nirbhay Singh, who successfully converted a penalty corner. In the 42nd and 44th minutes Dalwinder Singh sounded the board in quick succession to complete the tally. In another match, Daly College, Indore, defeated Sainik School, Nagrota, 4-1. Abdul Ramiz and Abhishek Malpani scored two goals each for Daly College. Mayo College, Ajmer, defeated Bhavan Sawan Public School, Delhi, 4-0 as Parikshit Rathore scored two goals for Mayo College. In another match YPS, Patiala, won against SDA Anandpur Sahib 1-0 through a goal by Prabhdeep Singh. In another tough match, Sanik School, Nagrota, gave a good fight to MNSS Rai before going down 4-5. Naveen Kumar of MNSS and Vivek Sinah of Sanik School scored three goals each. Welham Boys Dehra Dun defeated Bhavan Sawan Public School, Delhi 3-1. Marishek Gupta scored two goals for the Dehra Dun school. The match was reduced to 38 over because of the overnight rain. Reetinder Sodhi, skipper of Punjab Cricket Club won the toss and elected to field. Madhya Pradesh Cricket Association opener Muddasar Pasha was the top scorer for MPCA, scoring a run-a-ball 67, with eight fours. He was associated in a second-wicket stand of 77 runs with Rahul Bakshi (20). Right-arm leg spinner Sandeep Sawal returned the best bowling performance for PCC, snapping four wickets for 27 runs off eight overs. MPCA scored 179 for nine wickets in the allotted 38 overs setting PCC a target of 180 runs in 38 overs. Chasing the target, the PCC opened their innings with their skipper Reetinder Sodhi and Samrat Sharma. Sodhi scored 23 runs while Samrat Sharma made 34 runs. Pankaj Dharmani chipped in with 20 runs. PCC were all out for 157 runs. Dholepure (4 for 34) and (A. Kokje 3 for 37) were the main wicket-takers for MPCA, who got four points with this win. In another match at the Sector 16 cricket stadium, Rajasthan Cricket Association defeated Air-India, Mumbai, by three wickets. This match also started late because of the overnight showers and was reduced to 25 overs a side. Rajasthan skipper Rahul Kanwat won the toss and elected to field. Air-India opener P. Bethetly was the top scorer with 48 runs off 53 balls, with five fours. H. Kanitkar was run out for 10. Air-India scored 102 for nine in the allotted 25 overs. Rajasthan skipper Rahul Kanwat, with four for 17, and Pankaj Gupta (3 for 17) were the successful bowlers for Rajasthan. Chasing a modest target, Rajasthan scored 103 for seven in 22.5 overs, winning the match by three wickets. Pritam Gandhe (2 for 16) was the most successful bowler. Rahul Kanwat was declared the man of the match. Rajasthan got four points for this win. PATIALA (OSR): Ishan Malhotra’s all-round performance enabled PCA Colts to defeat Himachal Pradesh Cricket Association (HPCA) by five wickets in a group C league match here. Put into bat by hosts’ skipper Ankur Kakkar, HPCA were soon floundering at 36 for five with medium pacers Gagandeep Singh and Ishan Malhotra inflicting the maximum damage. The visitors were all out for a paltry 124. PCA started on a rousing note with opener Ishan Malhotra scoring a quick 50. He hit three sixes and an equal number of boundaries as his half century came up in just 32 balls. The PCA lads earned four points for the win. Ishan Malhotra was declared the man of the match. PCA Colts: 125 for 5 (I. Malhotra 50, Karan Goel 31; Ashok Thakur 3 for 57, Vikramjeet Mallik 2 for 32). In category ‘B’ Ajeetesh Sandhu led the field. He was followed by Fatehbir S. Dhaliwal with today’s score of 78. Raghav Wahi and Viraj Gadhoke were placed at the third spot. In ‘C’ category Kanishk Madaan again played a round of 81 and was the leader. He was followed by Rahul Bakshi with a round of 83 and Madhav Soi with a round of 84. In ‘D’ category Viraat Badhwar played a round of 86. He was followed by Raghav Bhandhari with a round of 92. Ankur Chadha with a round of 97 was at the third spot. After applying the cut in the A,B,C, categories the following players will play on the third and the 4th day of the tournament. Category-A: Ajeetesh Sandhu (76+74=150), Anirbhan Lihari (74+77=151), Gaganjeet Bhullar (76+77=153), Jaskirat Dullat (75+78=153), Aditya Singh (81+74=155), Navjosh Singh (74+81=155), Shubham Jindal (76+80=156), Akshay Butta (79+78=157), Himmat Rai (77+81=158), Balpreet Ghuman (79+82=161), Karan Vasudeva (79+82=161), Kunal Balhara (78+83=161), Narpat Singh (76+87=163), Arjunveer S. Chugh (83+81=164), Ratul Sood (82+82=164). Category-B: Ajeetesh Sandhu (76+74=150), Fatehbir S. Dhaliwal (76+78=154), Raghav Wahi (81+80=161), Viraj Gadhoke (82+80=162), Bhawani Singh (82+80 = 162), Sidhrath Seth (81+81 = 162), Rakesh Kumar (87+ 80=167), Abhinav Lohan (85+82=167), Akshay Ojha (88+80=168), R.S. Shirgaokar (88+92=180). Category-C: Kanish Madaan (81+81=162), Rahul Bakshi (81+83=164), Madhav Soi (84+84=168), Amanvir Guron (86+92=178), Mohd Asif (92+94=186), Shreyas Chugh (93+95=188), Anish Gupta (92+97=189), Dhruv’ A.S. Ghai (95+97=192). In their first encounter, Baba Lodhiana Academy boys registered a comprehensive 48-28 victory over Jalandhar. Dr S. Subramanian, former Director, NIS Patiala and coach of the academy boys, tried the entire bench and the result was clear by the end of second quarter itself as his trainees had established a comfortable lead over their opponents. Aakash and Sukhbir Dhillon were the main architects of the easy win, contributing 11 and 10 points, respectively. The other scorers were Gurbaj and Sahil, who accounted for eight and six points, respectively. For Jalandhar, Sunil (12) and Jatinder (9) reduced the margin. In the second match, Baba Lodhiana Academy defeated Faridkot with a comfortable margin of 20 points. The final verdict was 72-52 in favour of the academy boys and assured themselves a place in the last four stage. They are one more match to play against Muktsar which will decide who their rivals will be in the semifinals. The academy lads gained a five-point lead (15-10) in the first quarter, but both the teams scored equally in the second quarter to be 30-25. In the third quarter, academy boys outpaced the Faridkot players, scoring 20 points against 6 points scored by the later (50-31). In the last quarter, academy lads retained the lead and finally wrapped up the issue 72-52. For the academy, the bulk of scoring was done by Amritpal (23), Sukhbir (19), Vijay (12) and Sahil (9) while for the losers Manpreet and Varinder contributed 17 and 14 points, respectively. In other matches, PAP Jalandhar thrashed Bhatinda 74-32, Muktsar beat Jalandhar 72-42, Muktsar outplayed Bhatinda 36-28 and Muktsar defeated Faridkot 41-27.